Update: In May 2018, Motherboard noted that Drupe collected and left its users’ data, including selfies and audio messages, on insecure, publicly accessible Amazon cloud servers. The company said that less than 5 percent of its users’ data was collected in this fashion, and that it had deleted the files on those servers. The app has since been removed from the Play store. 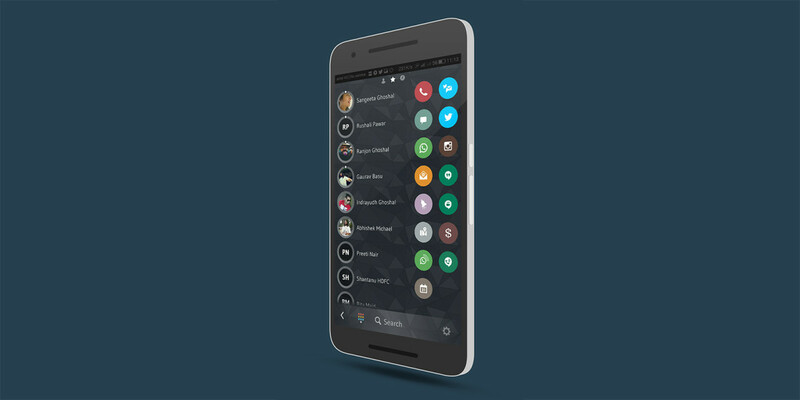 I’ve been impressed by Drupe’s clever design since I discovered it a year ago. It lets you connect with your contacts just by dragging and dropping their pictures onto the app of your choice, whether it’s WhatsApp, SMS or phone. Drupe integrated a dialer a few months ago and today, it’s got a slew of new features to make it even easier to get in touch with your contacts. The free app, which can be invoked by swiping on its floating button from your home screen or any app, now allows you to call people using Google Hangouts, WhatsApp as well as Skype’s service for connecting to mobile and landline numbers. It also lets you send direct messages to your friends on Twitter. The dialer has a couple of new tricks up its sleeve. For one, you can key in a number and then drag it to any of your phone or messaging apps, just as you would with saved contacts. This comes in handy when you’re exchanging numbers with someone for the first time. You can also dial and long press the call button to launch straight into speakerphone mode. Another nice addition is the missed call handler, which, instead of hiding unanswered calls in your history, displays them as floating bubbles. As with the rest of Drupe’s interface, you can drag each of these to your app of choice to reply. The best part about Drupe is that it makes contacting people more intuitive. It’s infinitely easier to first find them in the app (by dialing, searching or swiping through your lists of recent callers and favorites) and then choosing how you want to get in touch with them, than the other way around. If you want to ping someone at a later time, you can drop their picture onto the reminder bubble and add a note so you don’t forget. I also like the thumb-swipe option, which lets you target apps without having to cover the entire width of your screen. It’s worth noting that because of the way Facebook’s API works, you can only contact people on Messenger if they have the social network’s app and messaging tool installed along with Drupe. There are useful features like the ability to create a calendar event and invite a contact to it all in one go, and looking up their address on a map if you have it saved. You can also change up the look of the app by selecting from a range of backgrounds. I’ve found Drupe to be far more useful than most dialers bundled with Android phones. The only other one I’d consider using is Truecaller because its ability to identify unknown numbers comes in handy quite often. The team behind Drupe says it’s not looking to introducing ads into its free app anytime soon, but will instead experiment with other ways of monetizing it that blend in with the current experience. Co-founder and CEO Barak Witkowski says he hopes to soon add a feature to predict your next communication action based on your context (with data such as your location, the time of day and your last call). Also in the works are ways to allow users to interact with contacts beyond calling and texting them, similar to the payment feature that works with Square and Venmo. If you frequently use a wide range of apps to chat with your mates, Drupe is certainly worth a try.